No, you're not seeing things, the poor old feeble Baltic Dry Index broke a run of 35 days of straight declines by closing a modest 20 points higher at 1720 on Friday. It's still almost 60% down from as recently as 26th May, mind. Large bulk carriers, the so-called Capesize and Panamax* vessels of the type that ship iron ore into China, have reportedly seen rates fall from USD48,000 a day to charter in late May to around USD18,000 a day now. That mirrors the dramatic slump in the BDI, equating to a decline of 62.5%. 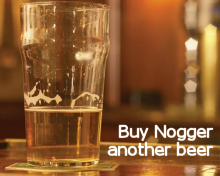 It's all about supply and demand say analysts. Effectively, there are too many boats chasing too few cargoes. The Chinese government's measures to cool rapidly rising property prices has seen demand for steel in China fall by 17% since mid-April. Meanwhile the global fleet increased by 23% in the first half of 2010 as new vessels ordered at the height of the boom in late 2007 and early 2008 arrive onto the market. Reports suggest that 20-25 of these new big bulk carriers are arriving onto the market every month, creating a significant oversupply. * Pananmax vessels are the largest ships that can still squeeze through the Panama Canal. Capesize are too big for the Panama or Suez Canals and must navigate around the Cape of Good Hope or Cape Horn. August soybeans finished 1/2 cent higher at USD10.19 1/2; August soybean meal closed at USD307.80, up USD0.20; August soybean oil closed at 38.31, down 28 points. Beans closed around 26 cents on the week. The insatiable Chinese Ministry say that, port congestion or not, they will import 5.8 MMT of soybeans this month. That would be the second highest on record, with last month being the highest. The long range weather report published by the NWS yesterday is calling for continued above normal temperatures through the month of August. That could hurt US bean production. September corn closed at USD3.94 3/4, up 2 1/4 cents; Dec corn closed at USD4.07 1/4, up 2 cents. Futures closed around 11 cents higher on the week. Traders remain concerned about hot and dry weather in the August forecasts. The dollar closed higher and crude oil closed lower on the day adding some pressure to corn. US weather forecasts are relatively conducive to a decent crop this year, although too much rainfall in some areas, and not enough in others, is still a concern. Sep CBOT wheat closed at USD5.87 1/4, down 9 cents; September KCBT wheat closed at USD5.99, down 6 3/4 cents; September MGEX wheat closed at USD6.11 1/2, down 1 cent. The trade was due a sell-ff after some sharp price-spikes earlier in the week. On the week overall CBOT and MGEX wheat were up 49 cents and KCBT was up 46 cents. This afternoon's weekly CFTC report listed Managed Money as reversing their short position of 8,566 contracts last week to a net long of 10,490 contracts. Nov London wheat closed GBP2.15 lower at GBP129.00/tonne; Nov Paris wheat ended down EUR4.25 at EUR172.50/tonne; Nov Paris corn was down EU4.00 at EUR168.75/tonne; Nov Paris rapeseed closed EUR8.25 lower at EUR362/tonne; Nov Paris malting barley rose EUR0.50 to EUR189.00/tonne. It's been a pretty stunning week all round, with Nov London wheat gaining an even GBP10/tonne, and Nov Paris wheat EUR11.50/tonne. Lower crop forecasts are still emanating from Russia on an almost daily basis, with leading analysts SovEcon today reducing their grain crop estimate to "lower than 75 MMT" compared to last season's crop of 97 MMT. We've also seen significant production cuts this week in Ukraine, Hungary, Romania and Kazakhstan. It's still a little too early to have an accurate angle on EU-27 wheat production, but crop losses here now seem to be heavily factored into existing price levels. 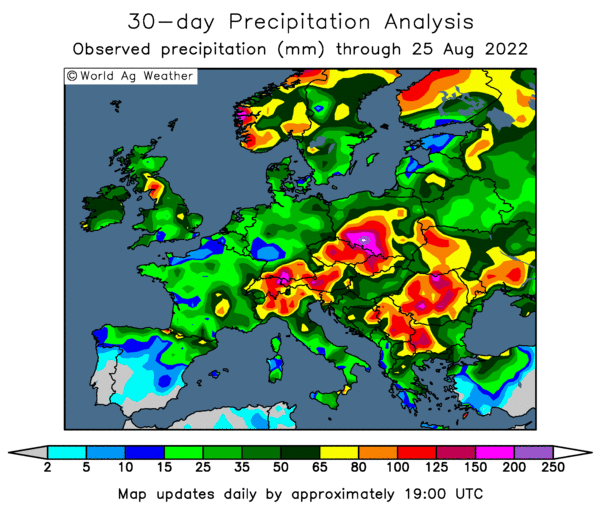 In the UK the weather has finally turned cooler and wetter, although how much benefit will be derived from that at this late stage in crop development is open to debate. Early barley harvesting is underway with average yields of around 6 MT/ha being reported. Russian crop estimates continue to decline with SovEcon now forecasting a grain crop of less than 75 MMT. That ties in with comments made by some other Russian bigwig who was maybe trying to tell us something Freudian when he said that the nation's reserves were sufficient to fulfil consumption even "if the harvest totals 70-75 million tonnes." Before you get too excited, SovEcon left their wheat part of the equation unchanged at 49-51 MMT. It's the barley crop that's taking a pasting, now estimated at 11-13 MMT, a 27-38% drop on last season. Barley is taking a hit in Ukraine too, with heavy rains in the Crimea region sharply reducing yields. UkrAgroConsult have now lopped a million tonnes off their estimate of only a week ago to 10.2 MMT. In Romania the Ag Ministry say that the wheat crop this season will not make the 6.7 MMT mark that they had forecast before floods hit. They've recently downgraded their estimate to 6 MMT, a 10% decline. The Romanian farmers’ association LAPAR however say that losses could be as high as 50%, but then again they could be "talking their own book" here. And they are Romanian after all, the only place in the world where you can buy a real live dancing bear on eBay. Two weeks into the new marketing year (and what a two weeks it has been), Brussels have issued (or is it sprouted?) export licences for 516,000 MT of soft wheat so far, a smidge down on where we were at this time last season. On a positive note, wheat imports currently only stand at 50,000 MT, this time last year it was 672,000 MT. The insatiable Chinese Ministry say that, port congestion or not, they will import 5.8 MMT of soybeans this month. That would be the second highest on record, with last month being the highest. They love it don't they? Simply LOVE IT. Meanwhile, This year's wheat crop WILL be more than 115 MMT they confidently predict. Predict isn't the right word really, they are telling us because they've already written it in the book. This is despite floods, drought and frosts. They've also written another "bumper" corn harvest in the book as well, they say, gleefully informing us that they have already "minimised" the impact of the abnormal weather. I don't know how they keep a straight face, I really don't. What next, they're only buying soybeans, corn, wheat and barley in vast quantities to support the global economy? Overnight wheat closed around 5-7 cents lower, with beans and corn narrowly mixed. The early calls are lining up with wheat down 4-6c, beans 2-3c lower and corn flat to down 2c. Is It 2007/08 All Over Again? The overnight wheat market is lower, although not by much, no doubt on a bit of profit-taking as traders await to see if more money will pour into the market today, or if we've gone high enough for now. London's near ten quid rally yesterday was all the more impressive given that it took place as the pound rose above 1.54 against the dollar. In the past three weeks Nov London wheat is up GBP27.25/tonne, and Nov Paris wheat up EUR36/tonne. Both 26% increases. What's changed in that time frame (apart from the England squad realising that there not as good as they thought they were)? The Russian and Kazakh drought was certainly well documented then, as was flooding in eastern Europe. If anything French and UK wheat prospects have stabilised and maybe even improved a little, we have at least had cooler temperatures and some rain. The USDA have come out with some rather bearish numbers on wheat stocks and supply. We've found out that the US HRW crop is better and bigger than we thought. Crop conditions in Western Australia have improved with rain and there's talk of a possible bumper year there in the east. 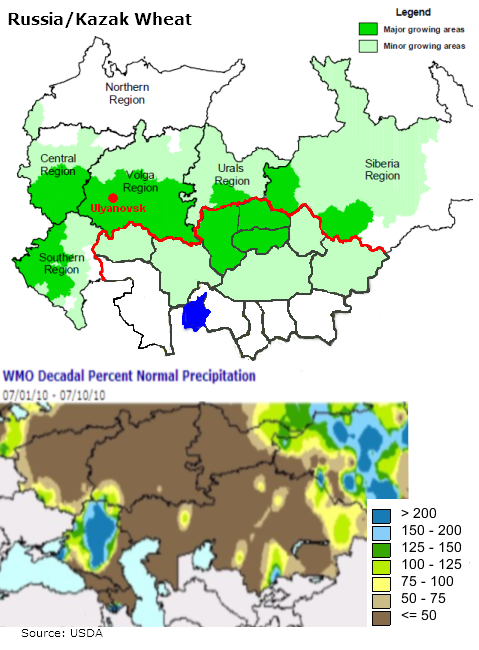 The harvest in Ukraine has stalled on persistent wet weather, but what has been brought in is yielding maybe a bit better than what was expected. Which brings us all the way back to Russia/Kazakhstan as being the main bullish driving force behind this rally. I've knocked 5 MMT off my production estimates for these two combined in the past three weeks, or around 0.8% of world production. Are stocks so scarce that losing 5 MMT justifies prices up 26%? Many are now likening this to "2007/08 all over again", suggesting that this is only the first 26%, there's a further 74% still to come yet. Are they right? The main similarity that I can see with then is that that particular rally had precious little to do with demand either. It was largely speculative led, and we all know what happened to that enormous house of cards. A big difference between then and now is that global wheat stock levels are much higher. Up by more than a third from 73 days worth of supply to 102 days now, based on the USDA's latest missive. And in case you've forgotten we've got more than 5 MMT of barley sitting in European intervention stores still waiting to find a home. So where do we go from here? We don't really know the answer to that one. As with 2007/08, that depends on whether - and for how long - investment money continues to pour into the grains sector looking to make a fast buck. One thing is for sure, they will all be stampeding for the exits again when the music stops, try and make sure it's not you left holding the baby. Remember too that the harvest is upon us, and what happens soon after that? That's right planting time. What will the world's farmers do I wonder if wheat is still GBP130/EUR175/USD6 (or even higher) when that comes around? That's one that we do know the answer to. Rearrange the following words: LOADS PLANT SH!T OF IT (AGAIN) ABSOLUTELY. REGRET ONLY TO IT SUBSEQUENTLY COLLAPSES MARKET WHEN (AGAIN). August soybeans finished 21 1/2 cents higher at USD10.19; November soybeans closed 26 cents higher at $9.88; soymeal settled USD9.30 higher at USD307.60; December soyoil settled 47 points higher at 39.37. Spillover strength from wheat helped push beans higher on pure sentiment. The USDA confirmed 116,000 MT of new crop soybeans sold to China, plus a further 238,000 MT sold to "unknown". Weekly soybean sales exceeded expectations at over 1.2 MMT. The National Weather Service released the 30 day forecast for August and continues to look for above normal temperatures for most of the US, that's a worry for soybean's critical development month. September corn ended up 8 1/4 cents at USD3.92 1/2 per bushel; December corn closed up 9 cents at USD4.05 1/4. Corn also followed wheat's lead higher. As with soybeans the NWS forecast for a hot August is a concern for corn. Not only that, the long range forecast calls for above normal temperatures through to October for the eastern Corn Belt. The USDA said that "unknown" bought 152,400 MT of US corn today. Weekly corn export sales were also supportive, towards the upper end of expectations at just over 1 MMT. Funds bought an estimated 25,000 contracts. September CBOT wheat closed at USD5.93 1/4, up 37 1/4 cents; September KCBT wheat closed at USD6.05 3/4, up 33 1/4 cents; September MGEX Wheat closed at USD6.12 1/2, up 29 1/4 cents. Sharp production losses all over Europe, Russia and the FSU are dominating the wheat trade. Speculative shorts are suddenly exiting the dance floor as quickly as they can, pushing things higher than perhaps they should go. Informa Economics slashed their wheat production estimate for Kazakhstan to just 11 MMT. Quality wheat looks like being in short supply in 2010/11, leaving the US suddenly sitting quite pretty. Although that means that their export prospects might improve long-term, weekly export sales were below expectations today at 309,400 MT. Phew, what a day! Nov London wheat closed GBP9.15 higher at GBP131.15/tonne; Nov Paris wheat ended up EUR10.25 at EUR176.75/tonne; Nov Paris corn was up EU8.50 at EUR172.75/tonne; Nov Paris rapeseed closed EUR11 higher at EUR370.75/tonne; Nov Paris malting barley rose EUR8.25 at EUR188.50/tonne. Nov London wheat hit it's best levels since June 2009, the Paris grains all set fresh contract highs. Crop production estimates are dropping like flies, with lower output estimates from Russia, Kazakhstan, Ukraine and Hungary all entering the market in the past few days. French analysts Strategie Grains lowered their EU-27 production estimates across the board today too, lopping 3.6 MMT off their soft wheat forecast and 1.5 MMT from it's barley figure. Durum wheat and corn estimates were also lowered. 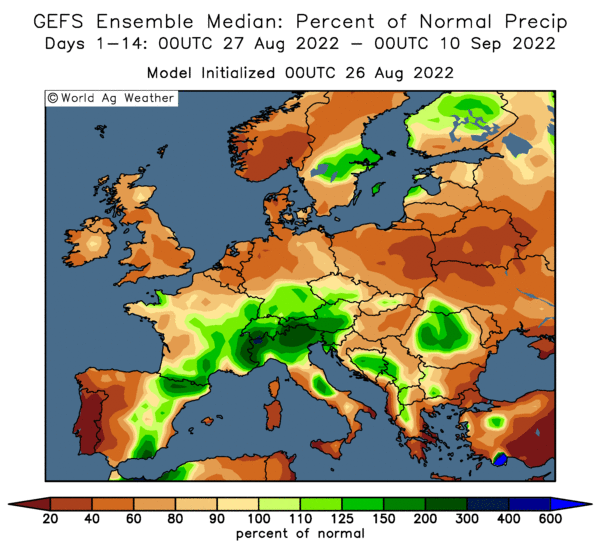 "The end of the growth cycle in Europe coincided with a spell of excessive heat in west Europe and excessive rain in east Europe, causing large reductions to estimated production in both parts of the EU," they said. Europe had been the only major exporter predicting a larger wheat crop this summer, but output here now is seen as being lower than in 2009, despite a significant increase in planted area. The falling freight market and weak euro is seen levelling the playing field for EU grains, helping them make inroads into destinations that would normally be out of bounds. The first barley cargo bound for China sailed from the French port of Rouen last week, according to media reports. The overnights closed with beans up 7-12 cents, corn 3-4 cents higher and wheat leading the way with gains of around 13-15 cents. Once again Chicago is following Europe, as London wheat moves to 13-month highs and Paris wheat to contract highs. The stories coming out of Russia just keep getting worse. Now Strategie Grains have dropped their EU-27 grain estimates just as Ukraine are also cutting theirs. Quality is also clearly going to be a problem in flooded Eastern Europe and then we've got similarly afflicted Canada. All of a sudden it looks like the US could be sitting quite pretty, and don't forget those nasty spec shorts, they must be sweating like a dyslexic on Countdown right now. I can't wait for Egypt's tenders this winter! Bearish news like a slowdown in China's economy is being pushed to one side as the market kin Europe races higher, with many now likening this to "the start of the big bull run of 2007/early 2008". There are certain similarities, it wasn't end-user driven then either that's for sure. The question to which we don't know the answer is how much higher can "the money" push it? Stocks are higher now than they were in 2007, and surely some lessons have been learnt from that particular bubble? We shall see, but for now the path of least resistance is higher. The USDA have just confirmed 116,000 MT of new crop soybeans sold to China, plus a further 238,000 MT sold to "unknown". In addition they say "unknown" bought 152,400 MT of corn. Weekly corn export sales were towards the upper end of expectations at just over 1 MMT. Soybean sales exceeded expectations at over 1.2 MMT. Wheat sales were flat at 309,400 MT. The ongoing drought in Russia is reported to have "killed 52.3 percent of grain seedlings in the Ulyanovsk region," according to a news report by news agency TASS. The harvest has started early as farmers in the region attempt to salvage what little they can. The average grain yield in the region this year will be "below 1,170 kilograms per hectare, which is almost two times smaller than the target," the report adds. The last time Russia has hit by drought was 2006/07 and they only produced 45 MMT of wheat that year, blocking exports entirely. Yes, I know that they are supposed to have 24 MMT of reserves this time round, but have they really? And what condition are they in, they've been there a year already? And half of that is intervention stocks bought at even higher levels than where we are now. Informa Economics meanwhile slashed their wheat production estimate for Kazakhstan to just 11 MMT, that's the lowest that I've seen yet. Our good buddies the Ukraine Ag Ministry have cut their 2010/11 grain crop estimate to 42 MMT, from last week's punt of 45-45.5 MMT. That's a 12.5% decline on last season's output and more than 20% down on the previous year. The harvest is progressing slowly, dogged by heavy rains, at only 5.8 MMT they add. That suggests a wheat crop of only 17.5 MMT, well below the USDA's misplaced optimism. Meanwhile French analysts Strategie Grains have joined the party, cutting their EU-27 soft wheat crop estimate by 3.6 MMT to 129.5 MMT, with durum wheat production also cut to 8.3 MMT, that gives us an EU-27 all wheat crop of 137.80 MMT. That's less than last year, despite higher plantings. They also cut their EU-27 barley production estimate by 1.5 MMT to 54.1 MMT, 13% down on 2009. Waiting in the wings is the EU-27 corn crop, which Strategie Grains now estimate at 58.1 MMT, a bit better than last year's crop. Many of these production losses have been on the cards for some time if you ask me, yet the market only seems to be reacting to them now that the harvest is upon us. From what I am hearing, the EU corn crop number could also come in significantly lower than current estimates once we get closer to that particular harvest. The poor old Baltic Cry Index closed another 81 points lower last night, crashing to 1709, a nice round 2500 points lower than it's recent May 26th high of 4209. That equates to a near 60% drop in little more than six weeks. It seems to me that it's days as a leading global economic indicator might be over. Things aren't really THAT bad surely? More like an indicator of an oversupply of ships than anything else. All you UK cereal growers out there, be careful what you wish for, because today is St Swithin's Day. Enough said. Anglo-Saxon bishop of Winchester and subsequently patron saint of Winchester Cathedral. His historical importance as bishop is overshadowed by his reputation for posthumous miracle-working. According to tradition, the weather on his feast day (15 July) will continue for forty days. Basically if it rains in the UK today, and just about everywhere is forecast to see some, it will rain solid for another 40 days and nights. Or approximately until the kids go back to school in September, even though they haven't broken up yet. When you put it like that it's not entirely unbelievable is it? Now then where did I put that brolly? CBOT August soybeans finished 2 1/2 cents higher at USD9.97 1/2; July Soybean Meal closed at USD313.00, up USD0.10; July Soybean Oil closed at 38.05, up 13 points. The August soybean contract became the spot month at a 39 cent discount to the expiring July contract. Estimates for tomorrow's export sales report range from 650,000 to 1,000,000 MT. The market is nervous about reports of heat setting up in the western corn-belt. The Climate Prediction Centre 6-10 forecast is ominous, calling for much above normal temperatures and low rainfall in the US grain belt July 19-23. July corn, which expired today, ended up 8 1/2 cents at USD3.75 1/4 per bushel; Sep corn ended up 9 cents at USD3.84 1/4, and Dec corn closed up 9 1/4 cents at USD3.96 1/4. Above normal temperatures are forecast out through July 28th for most of the growing region. Estimates for tomorrow's weekly export sales report are between 700,000 and 1,150,000 MT. Funds bought an estimated 11,000 contracts today. CBOT September wheat ended 9 3/4 cents higher at USD5.59; September KCBT wheat settled 5 3/4 cents higher at USD5.72 1/2; September MGE wheat finished 4 3/4 cents higher at USD5.83 1/4. Russia is now reportedly having it's worst drought in 100 years. Other production losses across Europe look like they may improve US export ambitions. HRW cash prices are reportedly running at six month highs, and hopes are up that US wheat might get a look in when Iraq announces the results of it's recent tender. Export sales estimates for tomorrow's weekly export sales report range from 300,000 to 500,000 MT. Nov London wheat ended GBP3.60 higher at GBP122; Nov Paris wheat was up EUR4.75 at EUR166.50; Nov Paris corn up EUR3.25 at EUR164.25; Nov Paris rapeseed up EUR5 at EUR359.25; Nov Paris malting barley was EUR0.75 higher at EUR180.25. Both London and Paris wheat set 12 month highs today. Corn, rapeseed and malting barley all set life of contract highs. Germany, Hungary and Ukraine all cut their grain production estimates too today. The German farm cooperatives association (DRV), said that this season's wheat harvest will come in at 23.8 MMT, 5.5% lower than last year's production. A severe drought in Russia meanwhile is cutting production forecasts there by the day. The President of the National Union of Grain Producers said that grain production will be 20-25% down on last year. Strategie Grains have cut their UK wheat yield projections for 2010 from 7.96 MT/ha to 7.72 MT/ha, predicting production of just under 15.5 MMT. The UK barley crop is estimated at 5.3 MMT, representing a reduction in output of 21.7% this year. The overnight markets closed mixed, with beans mostly 3-4 cents higher, corn 1-2 cents higher and wheat one up to one down. Crude oil is a little weaker around USD76.50/barrel and the dollar slightly easier too. The API said yesterday that US crude stocks fell by 1.7 million barrels last week, but that has more to do with the weather in the Gulf than demand. The Energy Dept are expected to follow suit and call inventories down around 2 million barrels this afternoon. 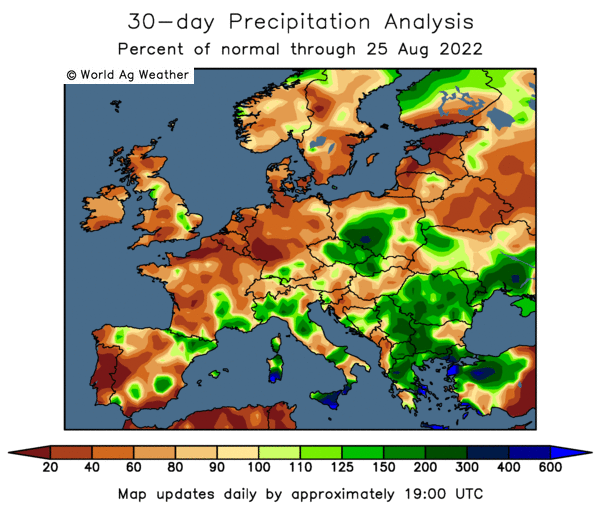 Again European weather again seems to be one of the main driving forces, with harvesting in Russia ahead of normal as farmers get their crops in before the drought situation gets worse. Germany, Hungary and Ukraine cut their grain production estimates too today. It looks like quality wheat will be in short supply in 2010/11, which suits the US just fine as they have plenty of it. HRW cash prices are reportedly running at six month highs, and hopes are up that US wheat might get a look in when Iraq announces the results of it's recent tender. It's a good job that wheat harvesting in the South is all done, temperatures hit 108 in Kansas yesterday. China say that they'll have another nice corn and wheat harvest this year, but then you wouldn't expect anything different would you? Early calls: Corn called 1 to 3 higher; Soybeans called 3 to 5 higher; Wheat called 1 to 2 higher. The German farm cooperatives association (DRV) has cut it's crop production estimates all round, saying that "continuing heat has caused over-proportional damage especially to wheat and maize plantings and late sowings of summer grains." Things could get worse yet, they said, warning of further cuts ahead after the mercury hit 40C over the weekend. This season's wheat harvest will come in at 23.8 MMT, 5.5% lower than last year's production. The winter barley crop was cut to 8.45 MMT, 15.5% down on last year. Spring barley is now estimated at 1.69 MMT, 23.2% down on last year. Corn output is now pegged at 4.0 MMT, and 11% fall on year ago levels, whilst OSR production is now seen falling 10.5% to 5.62 MMT. The NFU have warned milk buyers against paying dairy farmers 'too little too late' when it comes to the recent rate of modest milk price increases. "Up to 4.3ppl in additional revenue is being made by milk processors on the back of strong commodity markets, so with increases of as little as 0.5 up to 1.5ppl announced since June, there should clearly be more to come," they said. Meanwhile forage supplies are already running low, with many farmers suffering losses of 20-30% on first cut silage and up to 50% on the second cut, they added. The recent hot and dry weather has also forced many farmers to house their cattle indoors, pushing up costs further with straw prices so expensive at the moment, they say. Many farmers are already feeding what little forage they have, meaning that supplies this winter look like being particularly tight, they warned. French analysts Strategie Grains have cut their UK wheat yield projections for 2010 from 7.96 MT/ha to 7.72 MT/ha. That equates to a 2.6% decrease on last season's average of 7.93 MT/ha, they say. UK wheat production this year is pegged at just under 15.5 MMT, a 1.1 MMT increase on last year. The UK barley crop is estimated at 5.3 MMT, comprising 2.36 MMT of winter barley and 2.94 MMT of spring barley. That represents a reduction in output of 21.7% this year. England's spring barley was in a “disappointing state” they said, although they think that this will partially be offset by better conditions north of the border in Scotland. Is one intriguing headline in the Yorkshire Post that catches my roving eye this morning here. This 21 year old lad has been made "Yorkshire's Ambassador for Potatoes" apparently. Twenty one is a bit young to be an ambassador for that sort of thing surely? An ambassador for singing the National Anthem whilst wearing only an England shirt clutching a bottle of tequila in Aiya Napa maybe, but not that. Still, undaunted, young Ben rams home his message: "I'm trying to get across the message that potatoes are a good nutritious food and can be as fast to prepare as any rival. I often go to to the fields to lift a few premieres and put them in a bit of water in a bowl in the microwave. That way they are ready in two or three minutes." Jaimie Oliver must be cacking himself reading that. Keep an eye out for Egon Ronay coming a callin, Benny Boy. It would make an entertaining Masterchef though wouldn't it? Dishing up a microwaved potato in a bowl of water to Greg Wallace and John Torode. "It's beautifully presented in that Pyrex bowl, Ben, but I can't help feeling it needs a little more oomph. And this sauce is just too runny. It's kind of lacking a little in flavour." "Let's move onto your desert, the ice pop..."
Russia's Agriculture Minister, Elena Skrynnik, has admitted that the government need to re-assess their grain crop estimate of 85 MMT, without saying what to. The President of the National Union of Grain Producers says that the government's estimate is way too high and that production will be 20-25% down on last year. That implies a grain crop of only 72.75-77.60 MMT. Panic seems to be starting to set in, with the President of the Russian Farmers' Union going out of his way to assure the public that bread prices are not set to rise as the "price for bread does not depend on prices for grains," he didn't enlighten us as to what it does depend on then. Water? They're getting fed up with the monsoon season in northern India already I see. Torrential rain is seen threatening summer rice production in Punjab and Haryana, who combined account for a third of national summer rice output. I thought rice liked rain? If it's too wet for rice, what about the government's stored in sweaty bags in open fields wheat reserves? The ones that have been there more than twelve months? Yummy. The nice steady growth Chinese are forecasting a wheat crop of 115.1 MMT, a corn crop of 168 MMT and a rice crop of 196.6 MMT this year, Funny how they all just keep creeping up nicely no matter what the weather throws at them isn't it? The friendless Baltic Cry Index as I now call it, that closed a nice neat 50 points down last night at 1790. How many days on the trot is that? I've stopped counting now, a bit like Howard Webb dishing out yellow cards. It's the longest continuous fall in nine years apparently. Things are looking pretty precarious for Canadian farmers with crops in washed-out southern Alberta said to be running three weeks behind schedule and turning yellow from excess moisture. There's going to be a shortage of quality grain around this season by the looks of things. If the frost doesn't get it first. Thailand bought sugar yesterday for the first time in three decades, in a bid to ease a severe domestic shortfall. I thought I may have overdone it pocketing all those little sachets at Bangkok airport last time I was over there. Argentine President Cristina Fernandez, on a state visit to Beijing, says that she expects to have done a deal with China to allow Argy soyoil exports to resume "within days". She's invited the entire Chinese cabinet up to her room in the Beijing Holiday Inn and Grill for "a bit of a party". She also wanted to know if they had anywhere nice where she could get her hair done, and were there any Anne Summer's shops over there too. Farming Online are doing an online survey into this season's harvest results as they come in. But without Jeff Sterling doing the presentation. Holds finger to ear: "There's something happening in a field near Market Harborough, let's go over to Stan Collymore...." So far they've had an average barley yield of 6MT/ha coming in at an average moisture of 14.3 percent. They'll be dancing on the streets of Total Network Solutions tonight. July soybeans ended 1/4 cent higher at USD10.32; August soymeal settled USD3.80 lower at USD297.00; July soyoil settled 42 points higher at 37.92 cents per pound. A decline in last night's USDA crop ratings was supportive. Soybeans fell one point in the top two categories to 65% Good/Excellent. Tight nearby supplies and continued Chinese buying is keeping old crop firm. July corn ended down 4 1/2 cents to USD3.66 3/4 per bushel; Dec corn closed down 4 3/4 cents at USD3.87. Better than anticipated crop ratings from the USDA weighed on the market. The USDA last night pegged 73% of US corn as good/excellent, and increase of 2 points from last week. Crude oil gained more than USD2/barrel, which helped to reduce corn's losses. CBOT September wheat ended 13 1/2 cents higher at USD5.49 1/4; September KCBT wheat settled 12 1/4 cents higher at USD5.66 3/4; September MGE wheat finished 11 1/2 cents higher at USD5.78 1/2. A weak US dollar and firmer energy prices propelled futures to six-month highs. That is pretty astonishing, nervous large shorts have more to do with the price rally in US futures than anything else. EU grains closed mixed Tuesday, with November London wheat GBP0.10 lower at GBP118.40/tonne; November Paris wheat ending EUR1.50 higher at EUR161.75/tonne; November corn fell EUR0.50 to EUR161.00/tonne; November Paris rapeseed was EUR6.25 higher at EUR354.25/tonne; November Paris malting barley fell EUR0.25 higher at EUR179.50/tonne. A cooler, wetter forecast was enough to take the sting out of the recent rally, although many participants doubt how beneficial this will be at this late stage. At home rains eventually arrived into the main growing areas in the south east, although some growers there that I am talking to said that they'd have preferred the dry conditions to have remained. "Rain now is too late to do any good, if anything it will only hinder harvest progress," said one. "Rain may slow it down a bit and also even the ripening but I am hoping that it stays fine now till the harvest is done, for fear that if the weather does change, it will rain for a month," said another. "Until we had a huge rainstorm at the beginning of June, I was very pessimistic about yields. That one rain event will put a lot of money in the bank, because we have had bugger all rain since," he added. It seems to be developing into an exceptionally difficult year to evaluate, with the recent price spike reputedly catching out several "short and caught" merchants. That said, I am hearing reports of some growers already likening the recent rally to "just the beginning" of a 2007-style boom all the way back to GBP200/tonne. At least Liffe seem to be doing alright out of it, they reported record volumes last week. Is that fund money re-entering the market, or just wishful thinking? I suspect that it might have a lot to do with merchants hedging their bets as consumers avoid the market like the plague myself. The USDA last night pegged 73% of US corn as good/excellent, and increase of 2 points from last week. Soybeans fell one point in the top two categories to 65% G/E. Spring wheat G/E was steady at 83%, and winter wheat was 63% harvested, up from 54% last week. The ongoing drought in Russia means that harvesting is well advanced there, with 9.6 MMT of grains already cut. Of that total 6.2 MMT is wheat and 1.6 MMT barley. Things might be looking up in Australia, where beneficial rains fell in WA state late last week. State capital Perth picked up 93mm in four days Thursday to Sunday, it's best four day total in five years. Meanwhile a La Nina weather pattern forming in the Pacific Basin could continue to bring rains to the east of Australia, potentially boosting grains output in NSW and Victoria, say the Australian Bureau of Meteorology. La Nina conditions frequently occur within twelve months of an El Nino episode, and are usually associated with good rains in the east of the country. The flip side is that whilst last year's El Nino proved to be a rain-giver to South America, leading to record soybean production and breaking a near two year drought for the dirty cheating Argies (and the goaline handballing and blind refereeing Uruguayans), the nicer sounding La Nina frequently means eastern Australia gets all the rain meant for South America. Hot and dry weather above 30 degrees Celsius will continue to prevail in central European Russia, meteorologists say. Lack of forage is becoming a serious issue, and cereal growers in the region also now say that they are worried over their ability to repay loans taken in the spring in anticipation of another bumper harvest. Whilst the damage already appears to be done to Russian and Kazakh wheat, corn and sunflowers might be next to see potential yields plunge as the enter the key pollination stage, farmers fear. Russian daily newspaper Izvestia said that the situation was causing "panic" in regional newspapers where, I love this quote, "you will feel the breath of medieval horror in pages turned yellow from the heat." Agriculture Minister Yelena Skrynnik has been forced to deny wild rumours that the country may even have to import grain this season. She re-affirmed that they have 24 MMT of reserves (with her fingers crossed behind her back), although she did concede that export hopes might need to be trimmed somewhat. Not too far away it's rain that's the problem, not lack of it. In Crimea in the Ukraine the local Ag Ministry say that up to 30% of the barley crop could be lost as heavy rains lash the region. July soybeans ended 6 1/4 cents higher at USD10.31 3/4; August soymeal settled USD0.10 lower at USD300.80; August soyoil settled at 37.61, up 11 points. Weekly export inspections came in at 6.5 million bushels, higher than last week. The year to date is still ahead of last year by 212 million bushels. After the close the USDA said 65% of the soybean crop was rated good to excellent, down one percentage point from last week. That represents a drop in ratings for the fifth week in a row. July corn ended down 4 cents at USD3.71 1/4 per bushel; Dec corn ended down 3 1/2 cents at USD3.91 3/4. The USDA reported 152,400 MT of corn sold to unknown for 2010/11 today. On Friday they pegged global corn stocks falling to less than a 62-days supply, the 3rd tightest of the last 35 years. After the close the USDA said that 73% of the corn crop was rated good to excellent as of Sunday, up two percentage points from the previous week. German analysts F O Licht peg the global corn crop at 804 MMT, 28 MMT lower that the USDA said on Friday. CBOT September wheat ended 2 1/4 cents lower at USD5.35 3/4; September KCBT wheat settled 1 1/4 cents higher at USD5.54 1/2 September MGE wheat finished 4 cents higher at USD5.67. The USDA cut projected world production and ending stocks on Friday, but not as far as most had anticipated. German analysts F O Licht cut their world wheat production estimate to 656 MMT today, 5 MMT lower than the USDA. Export inspections came in at 14.1 million bushels, lower than last week than the previous week but still ahead of last year. EU grains closed mixed Monday, with November London wheat GBP0.50 lower at GBP118.50/tonne; November Paris wheat ending EUR0.75 lower at EUR160.75/tonne; November corn rose EUR1 to EUR161.50/tonne; November Paris rapeseed was EUR0.75 higher at EUR348/tonne; November Paris malting barley was EUR4.25 higher at EUR179.25/tonne. The market still seems a little disappointed that the USDA didn't reduce world wheat production by more than the 7.5 MMT than is did on Friday. However, they are notoriously slow to react to rapid changes in the market. German analysts F O Licht today cut their 2010/11 global wheat estimate to 656.37 MMT, fully 5 MMT below the USDA. For good measure they also came out with a world corn crop estimate a whopping 28 MMT beneath our friends in Washington. Clearly they can't both be right. Intriguingly, the German wheat estimate actually included a Russian crop of 56 MMT, 3 MMT more than the pooh-poohed USDA figure. Many in the trade are now talking only 48-50 MMT here, so it could be that even F O Licht's estimate is too high. Early reports coming out of Germany suggest that barley yields this season are looking likely to be 10% lower than last year. There seems to be some genuine concern that wheat and corn could fare even worse when the combines start rolling into those fields. For now we seem to have risen enough for the time being however, until we get some further hard evidence of lower yields in France, Germany and the UK, once the wheat harvest gets underway. German analysts F O Licht reckon that the USDA overstated world corn and wheat stocks by 33 MMT on Friday. They've just cut their world wheat production estimate to 656 MMT, and pegged the global corn crop at 804 MMT. That's 5 MMT and 28 MMT lower respectively than our mates in Washington chucked into the arena just 72 hours ago. Quite a lot to lose over a weekend, 33 million tonnes isn't it really? Half a million tonnes an hour, just over 7,500 MT/minute, or 125 MT/second just "evaporating" into nowhere. If the USDA were driving my bus I don't think I'd get on it, even if it had wings. My German corresspondent, Joachim Ruhmann, reports of disappointing winter barley yields in northern Germany. The Bavarian Farmers' Association estimate grain production (excluding corn) in the region at 6.3 MMT, 10% down on last year and 6% below average. Crops on lighter soils, in the north in particular, are showing signs of premature ripening, they say. Further south things are more positive, with early harvests on heavy soils showing good yields and quality, although samples are not as good on lighter sandier soils, they say. Corn is suffering under drought conditions they add. In Saxony, early winter barley harvesting has been producing bushel weights of only around 60 kg/hl. Low temperatures in May followed by the subsequent drought have also caused many crops to ripen too early, reducing yields, says Wolfgang Vogel of the Saxony Farmers' Association. There is also concern over the quality of wheat in Saxony, where crop development is already over due to the heat. Although the ears are white, below the stems are still very green, he says. Local corn is "in a pitiful state" with stems no higher than 30 cm tall, which is we below normal and establishment very "patchy", he adds. Interestingly some barley, rye and triticale crops are also being harvested as whole crop silage, for fear of impending bottlenecks at the German biogas plants, Joachim tells me. New crop barley prices have improved considerably this past week, with EUR125-130 ex farm now being achievable for September collection, he adds. After all the uproar of last week, this week has begun with an anti climatic whimper. If last week could be likened to the closing minutes of the Christmas Day episode of EastEnders, then so far today we are taking a shuftie at a heavily bejumpered Valerie Singleton making some last minute adjustments to Tracey Island. A few more palm trees made out of pipe cleaners here, a retractable swimming pool made out of tin foil and a corn flakes box there. Still, we live in hope of a glimpse of ankle later tonight when the USDA release their weekly crop progress report. Last week they had corn crop conditions were at 75.0% good to excellent, with 69% of soybeans, 65% of winter wheat and 84% of spring wheat rated likewise. There seems to be a feeling that last week's rallies were more than enough for the time being, with the overnight markets closing mixed, but mostly lower today. Beans finished with losses of 2-3 cents, with wheat and corn both narrowly mixed. There isn't too much direction from either the dollar or crude oil at the moment, with both little changed either so far. The USDA have just reported 152,400 MT of corn sold to unknown for 2010/11. Data just out from the CFTC shows funds cutting short positions in corn last week. The USDA reported Friday on global corn stocks falling to less than a 62-days supply, the 3rd tightest of the last 35 years. Trade talk that the USDA are possibly already a bit optimistic on projected yields this year, doesn't leave too much room for further losses in production. US wheat still looks over-priced, that's why stocks are so high, and exports just so so. Russian what production looks like it may well end up lower than current official estimates, 53 MMT is what the USDA said Friday, there could be another 5 MMT to knock off that yet. They raised Chinese production by 2.5 MMT on the back of recent beneficial rains for key production areas. I don't see output here getting up to the levels that the USDA are saying. That's significant as the US and China combined hold more than half the world's wheat reserves, according to Friday's numbers. Old crop US soybean stocks remain tight, and demand from China keeps filtering through, which should support this side of the harvest. Early calls for this afternoon's CBOT session: Corn called flat to down 1; Soybeans called 1 to 3 lower; Wheat called mixed. Beelzebub, has a badger put aside for meeeeeeee...Queen guitarist Brian May has apparently thrown the weight of his Gibson Les Paul behind calls to stop the badger cull. The rock star amusingly turns from "legendary Queen guitarist" to "Dr May, who has a PhD in astrophysics" halfway through this article in the Farmer's Guardian, as if that has a bearing on anything. I remember seeing "legendary Genesis drummer" Phil Collins on the telly once. No not when he did Live Aid, it was Everton versus Spurs in the 1995 FA Cup semi-final. I love early Genesis, and had been quite an admirer of Spurs-supporting Phil Collins up until then. And I'm watching the game, and it's halftime, and Everton are winning nicely, and they trot Phil Collins out to give us his impression of the first half. And I'm thinking why would I or anybody else be interested in what "legendary Genesis drummer" has to say about a professional football match. I don't expect to hear badgers discussing the merits of the latest single by Michael Buble do I? If you get my drift. If they hadn't been so quick to cry wolf last year also, then maybe we'd have been more inclined to believe them this time round. The difference this time is that respected private firms like SovEcon are also slashing their production estimates on a weekly basis too. "The grain crop in Tatarstan will come to about 1 million tons this year, down from an average 4.5 million to 5 million tons," say Bloomberg. I'm no expert, but erm that sounds like 75-80% down doesn't it? A hastily convened meeting with a high court judge on Friday has Brazil's top grain port of Paranagua back open for business. The port had been closed Thursday on the orders of Brazil's environment agency. European grains have started the week on a firmer footing, with front month London wheat opening up GBP0.75/tonne, and November Paris wheat up EUR1.50/tonne. Paris corn is around EUR2-2.50/tonne higher and Paris rapeseed up EUR1.50-3.00/tonne. NYSE Liffe have announced that daily volumes in Paris milling wheat reached record levels last week. Legitimate hedging or rampant fund speculation? Thailand, the second largest sugar exporter in the world, is tendering to buy 100,000 MT of the white stuff to bolster domestic shortages. North eastern Saskatchewan picked up an extra 18 to 70 mm of precipitation on already-saturated fields in the period June 29 to July 5, according to Saskatchewan Agriculture's latest weekly Crop Report. Cropland topsoil moisture here is rated as 90 per cent surplus and 10 per cent adequate. The poor old Baltic Cry Index was down again Friday, for seemingly the four millionth session in a row, closing at 1902 for a spectacular 55% decline since late May. This year's Bulgarian harvest could be a disaster, according to the National Association of Grain Producers. Incessant rains mean that wheat quality and yields have been badly hit, they say. This could be a repeat of the terrible harvest of 1997, when quality was so bad farmers struggled to find any buying interest at all for their largely uninsured crops, they add. Things aren't so bad in the Czech Republic, where the Czech Statistical Office say that this season's grain harvest will be only 5 percent lower than last season at 6.58 MMT. Winter wheat will be 1.3 percent down, accounting for 4.17 MMT of that, with the spring barley harvest pegged at 1.19 MMT, a drop of more than 12 percent on the year. This season's rapeseed harvest could produce 1.143 MMT, which would marginally beat last season's record crop by 1.4 percent, they say. 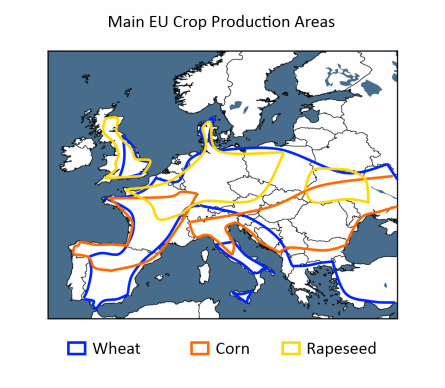 The country will also harvest 203,000 MT of spring wheat and 515,000 MT of winter barley, they add. Interested to dive across the Pennines yesterday, heading east/west across the M62, a drive I do quite often. You know the bit that has a farm in the central reservation? Just before there on the left is a large reservoir, well let me rephrase that there is usually a large reservoir. If you were going for a sail yesterday you had a fairly long walk before your boat got into the water. In the run up to the start of the British Open on Thursday, they were reporting on the Scottish Open from Loch Lomond on the BBC last night. They showed brief highlights of the odd put being sunk on the greens there. Greens? Browns more like. Cut straight to Silverstone for news from the Grand Prix. What's that the reporter is standing on? Is there something wrong with the telly? It suddenly looks like we've skipped to Tribal Wives in Ethiopia, no we haven't he's stood on a "grass bank", except it's a grassless bank. Think Southport sand dunes, except Silverstone probably has a shorter walk to get into the sea, and you'll get the general idea. Talking of sport, I can't go without mentioning the World Cup: I thought that Howard Webb was more than lenient towards the Dutch, the moaning orange buggers. I also thought that it was a nice touch at the end when it looked like they'd allowed the Spanish WAGS onto the pitch to kiss their husbands/boyfriends, then I realised it was just Carels Puyol running around doing that. The big girl. Fernando Ladyboy Torres didn't seem to mind too much though. The pain of his hamstring injury was quickly forgotten with Puyol's tongue down his throat. I mourn the death of the manly handshake I really do. You never used to see Bobby Charlton and Alan Ball carrying on line that did you? I mean I know Bally was ginger and everything, but even so. They knew how to behave in those days. "I'm Having Nobby Stiles' Baby" - not the sort of headline we used to see back in the good old days was it? Those lads weren't all knocking off each other wives were they? Snorting crack cocaine off the naked 42DD breasts of a page three girl. No, they were too busy stealing jewellery for that sort of caper. It was never proven, mind. Variable seems to best describe the state of play, with what is looking like being only an average wheat crop at best this season. Although rains were forecast to finally arrive to the parched south east overnight, many are saying that they're too late to do much, if any, good. All in all it hasn't been an ideal season: a dry autumn enabled good planting progress, but also caused late emergence. Follow that up with a hard cold winter, a dry spring leading to poor nitrogen uptake and then a heatwave means "we are lucky to have anything at all," one grower in the south east tells me. His yields will be "at the bottom of our average, if we do not set a record low for recent years," he adds. In his area 2nd and subsequent wheats are generally thin, and were a week or so behind in development before the hot weather hit. Rain now will not help these crops, he says. Growers here seem to be gearing up to start harvesting wheat around the first week in August. Indeed there seems to be a feeling that rain now may slow things down rather than add anything to final yields. Heavy rains continue to dog the harvest in Ukraine, where so far 4 MMT of grains and oilseeds have been harvested as of July 9th, according to the Ag Ministry. This time last year favourable weather conditions meant that over 6.5 MMT had been harvested, they say. Yields are down 5.4%, averaging 2.43 Mt/ha, as opposed to 2.57 MT/ha. Most of what has been cut is barley, accounting for 2.65 MMT of the total, with yields averaging 2.37 MT/ha. Ukraine farmers have also cut 1.25 MMT of wheat at an average yield of 2.71 MT/ha and 0.51 MMT of rapeseed, yielding 1.46 MT/ha. More widespread rain over the weekend is causing concerns of winter barley starting to deteriorate, and means that OSR ready to harvest is going to have to wait a while longer yet to dry out.